Box Dimensions (LxWxH) 16.3 x 11.5 x 3.7"
15.4" MacBook Pro with Touch Bar (Late 2016, Silver) is rated 4.6 out of 5 by 293. Rated 4 out of 5 by Anonymous from Solid The build quality and keyboard are amazing. The Touch ID is very useful but not there yet. I'm hoping future updates will allow me to use the ID to authorize everything, such as updates installs etc. currently it's a mixed bag. As for the touch bar I would say it is very gimmicky. I have yet to find a useful feature for it but will say it is nice, doesn't take away from the experience. Overall really like the darker color and the track pad and it's fast. If you need to upgrade just get the latest. Buy a $7 adapter from USB c to a. Rated 5 out of 5 by Anonymous from Awesome laptop! This laptop has been exactly what I've been looking for. Lightweight, reliable, very thin, and fairly powerful to get things done! I agree with the majority of buyers in the fact that it's extremely overpriced. However, I will say that I've purchased and returned other laptops before settling on the MacBook Pro. Compared to other high-end laptops by other brands, the MacBook Pro is lightyears ahead in quality and build. From the hardware components to the software, especially MacOS. I've you have a little extra money to spend, I highly recommend this product. Save yourself the hassle of replacing a laptop again in probably 2 years. Rated 5 out of 5 by Anonymous from Form and Function This laptop is beautifully crafted out of aluminum. So light, thin and seamless unlike most plastic cased PCs. The keyboard keys feel great and the unit is virtually silent even though there are two fans. It gets a little bit warm but not hot like my last laptop. Fast graphics and very responsive trackpad. Great battery life too! I am getting close to 10 hours of use. It's true, you get what you pay for and this is definitely at the level of luxury laptops! Only downside is the Thunderbolt 3 ports but I just bought a couple USB converters since most of the things I hook up to it are USB and problem solved. It's the only way to make the case so thin. Plus you can charge it from any of the ports on either side. Rated 3 out of 5 by Jose from Really good looking machine, so so upgrade. Moved from a 13 Retina MacBook Pro, the machine is wonderfully designed, amazing how the shaved so much thickness on the machine and the Space Grey color makes the machine look just mean. Now, battery life is just unacceptable, really bad under normal circumstances. The Touch Bar is a nice addition but just that, nice but as of now, not really a game changer feature. Will have to wait and see what future versions of macOS can do with the Touch Bar and also how other apps take advantage of it, in the meantime an OK upgrade to a really good machine, the MBP 2014 Retina 13 but not the jump I expected. Rated 5 out of 5 by Kimberly from Better than expected! This laptop is amazing. It's fast, has beautiful graphics, nice audio and is light weight. I was hesitant to pull the trigger because I haven't used a mac in 15 years and always heard PCs are better for business use. I now completely disagree and feel more productive than ever with my business work. The integration of iphone texts and phone calls is a huge plus. I never miss texts or phone calls when my iphone ringer is off and it's so much easier to reply to texts via the MBP keyboard. I purchased an inexpensive USB converter for my microsoft mouse - it works perfectly. The transaction with B&H Photo was simple and exactly as described regarding product, free shipping, delivery and $0 sales tax. Rated 4 out of 5 by Chris from Great laptop The only reason I didn't give it 5 stars is for a couple reasons. I understand how amazing and valuable the USB-C drive is for the future of computing. However, I really miss the magnetic charging cable from my old Macbook Air. It was convenient for those times you were charging the laptop somewhere that kids may have a tendency to get too close to it. The USB-C charging for the MacBook Pro does have the advantage of being able to charge the laptop on either side though, which is nice, since there are 2 outlets on each side of the laptop. The touchbar is awesome and works well. The screen resolution is wonderful. And overall, it works very well! Hi all, what type of micro does it has? Could be skyline? And how much cache? 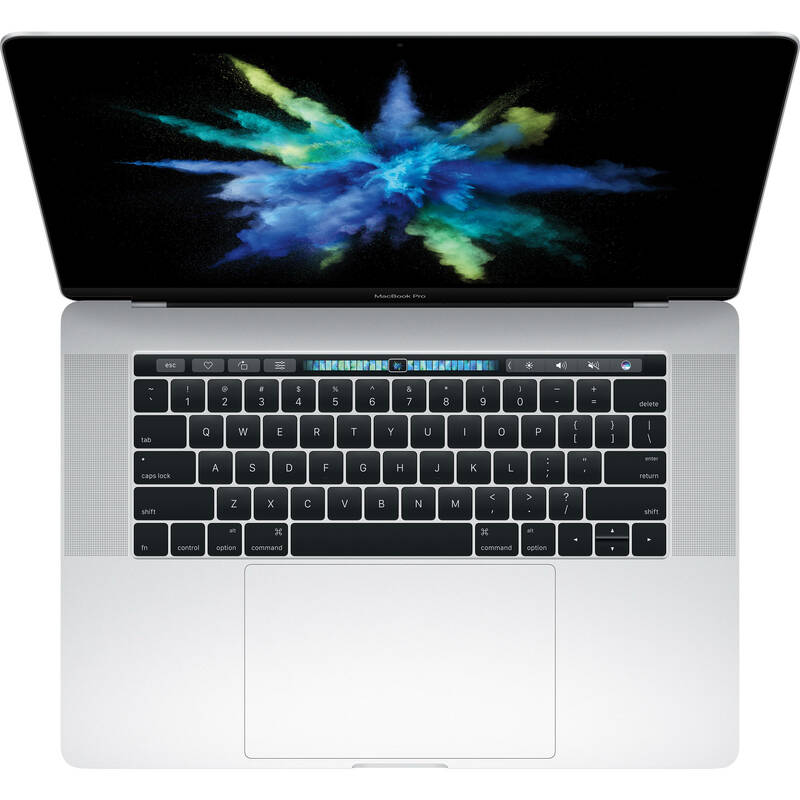 The 2016 Macbook Pro uses a Skylake processor with 6MB of Smart Cache. Does this have standard one year warranty. This comes with the standard Apple warranty of a Limited 1-Year Warranty with 90 Days of Free Telephone Support. Do you have with spanish keyboard in stock? If I buy it in USA but I'll use it in Colombia, does the warranty works? We do not have with the Spanish Keyboard. Nor can we order it from Apple. We are only able to order from apple the latest version with a different keyboard to be shipped to a USA address. We are not permitted to ship Apple products outside of the USA. Do I pay custom fees for the delivery in Greece? Unfortunately we cannot ship Apple products outside of the US. There is no difference other than the color. At times manufacturers give us models in different colors at a discount as perhaps those colors did not sell as well. can I use Sanho HyperJuice 1.5 External Battery with this via usb a to usb c cables ?? if not then what should I do ??? No, you would need a charger that can power the 87W USB Type-C Power Adapter. this is new one or displayed used? Apple 15.4 MacBook Pro with Touch Bar (Late 2016) is brand new and sealed in it's original Apple box.